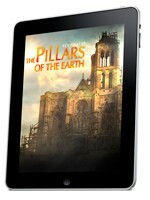 The Amplified Edition of Ken Follett’s international bestselling novel The Pillars of the Earth has been released by Penguin Books and Starz. It combines the novel with new content from the upcoming mini-series. This electronic edition is available for the iPad, iPhone and iPod in the United States. Beyond just offering an e-version of the novel, the amplified edition showcases exclusive videos with the author about his research and the process of bringing his book to the screen, and an innovative Character Tree that provides a remarkable aid to keeping the story’s myriad characters straight. It also gives users the opportunity to read the novel and watch key scenes and images from the event series in tandem over the course of the mini-series, which is starting on North American television on July 24th. An interactive Character Tree, housed in a virtual stained glass window, grows as characters are introduced in the book, allowing the reader to learn more about the selected characters and their corresponding relationships. As the story progresses, the stained glass window becomes more intricate and reveals more and more about the characters. Contextual video footage and still images are carefully blended into the eBook from the corresponding section of the mini-series, so readers can choose to watch beautiful clips of cathedrals, horses and men in shining armor while inside the eBook. Or if they prefer, they can watch clips as well as longer scenes in another section of the Amplified Edition. Ken Follett’s Multimedia Diary, which is the author’s on-set impressions of the process of bringing The Pillars of the Earth from page to screen. Behind-the-scenes insights into the making of the event series, looking at how the filmmakers captured Follett’s vision and created the medieval world of The Pillars of the Earth, including interviews with the actors, director and producers. A Listening Lounge features music—including hymns, soundtrack themes, and battlefield scene scores—from the mini-series. A sneak preview of Ken Follett’s next book coming this fall. The Pillars of the Earth is a sweeping epic of good and evil, treachery and intrigue, violence and beauty, a sensuous, spirited story set against a backdrop of war, religious strife and power struggles in 12th Century England. Ken Follett’s book, first published in 1989, has sold more than 14 million copies worldwide and been published in more than 30 languages.